Who says that books and music don't go together beautifully? Join two of BookPeople's biggest music aficionados, Bosco and Stephanya, as they discuss music books of all genres. From Iggy Pop to Hank Williams to the Rolling Stones to Muddy Waters, they dig deep into the history of music. Join us the third Sunday of every month at 5 pm. This month’s book is This wheel's on fire by Levon Helm. 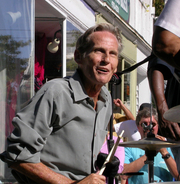 Levon Helm is currently considered a "single author." If one or more works are by a distinct, homonymous authors, go ahead and split the author. Levon Helm is composed of 2 names. You can examine and separate out names.